When trading binary options, traders have a wide variety of financial vehicles to choose as their underlying assets. These may include stocks, indices, and currencies. One of the more popular choices that is used by binary options traders is currency which proved excellent opportunities for both technical and fundamental traders to benefit from market movements. Trading with this particular underlying asset is quite simple, therefore allowing both experienced and novice traders alike to capitalize on potential profit in this arena. What are the Major Currency Pairs Traded in the Binary Options Market? When traders use the Forex to trade in binary options, they are essentially able to take advantage of market movements on a worldwide basis, and allow themselves the opportunity to capitalize on the rising of one market that can subsequently cause shifts in other currencies. It is also important to understand that currency pairs tend to have their own ‘personalities’ which is linked to the interrelationships between certain pairs. Some currencies have a tendancy to move slowly whilst others are extremely volatile. Using binary options to trade currencies has the added advantage that volatility in the markets does not mean an increased risk of losing additional money. Since losses are predetermined with binary options, trader’s can confidently trade all currency pairs without worrying if they are exposing themselves to unforeseen risk. There is a wide variety of different currencies and currency relationships to choose from. Each currency is noted by a symbol. For example, the United States dollar is denoted by the symbol USD, while the Canadian dollar uses CAD. EUR/USD – In a recent Bank for International Settlements survey, it was shown that the most traded major currency pair is the Euro and U.S. Dollar. While this particular pair has slow movement in comparison to the other major pairs, it is a very good place for newer traders to begin. USD/JPY – The U.S. Dollar and the Japanese Yen offers traders potential profit in that the Japanese government intervention to strengthen their own currency moves this relationship lower, and thus this relationship is somewhat predictable for traders. USD/CHF – As the U.S. Dollar and the Swiss Franc are negatively correlated to the EUR/USD, traders should make comparisons of both currencies’ charts prior to investing funds into this currency pair relationship. GBP/USD – The British Pound and the U.S. Dollar offers traders the potential for profit as high yield and growth in the United Kingdom tends to drive this particular relationship higher. When a binary options trader executes a trade using the Forex as the underlying asset, they should first have an understanding of how the currencies they choose compare against each other. Therefore, prior to moving forward, it is wise to know the strengths and weaknesses of the currencies that are chosen as well as the state of the overall economy that is backing that particular currency. As an example, if a trader opts to bid on the U.S. Dollar (USD) and the Canadian Dollar (CAD), this individual should have a grasp on just how strong these two currencies are in relation to each other. In addition, once they understand this relationship, they should also be able to make a prediction on whether this currency relationship will rise or fall over the short term. When traders opt to use currency pairs in their binary options trading activity, they have a number of advantages. First, the trading of currency pairs can benefit from the performance of two currencies – and therefore, two economies – while adding an additional global element to the trader’s experience. With the understanding that currency pairs are a truly global asset, it is therfore possible to actively trade different curreny pairs 24 hours per day. This is because of the different timezones in which currency pairs operate and make it ideal for binary options traders who perhaps cannot access the markets during the working day in their timezone. This also means, of course, that there are many more oppotunities for binary options trader’s to make money and spot profitable opportunities throughout the day. Using currency pairs is also one of the most dynamic ways that binary options traders can be involved in the market. This is because the value of currency is in a constant state of change – which is at the very heart of the overall binary options market. The introduction of sixty second binary options, as well as the ability to trade longer options, makes currency excellent for both scalpers and swing trader’s to look for opportunities to trade. This makes using currency pairs a very good fit for those who enjoy trading accross a range of different timeframes and strategies. IQ Option is one of the largest trading platforms in the world, with over 7,000,000 accounts opened. Your money is safe thanks to segregated trust accounts for cliends’ funds. And profit payouts are among the fastest in the finance industry. Start now! 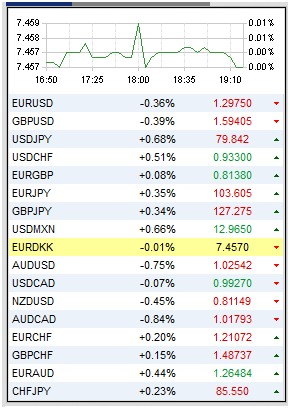 Trading with EUR/USD or Other Currency Pairs? Is It A Good Idea to Trade Mostly with Commodities? What to Consider When Choosing a Broker?